If you sell or distribute your products on an international scale, you are faced with the demanding challenge to communicate across different time zones - as effective as possible. Twitter, Facebook & Co. are the main point of contact between you and your potential customers. So, your social media management accounts for most of your time invested in this effort. You have to be online, when your fans and followers are online. You have to be visible, when and where your target group can see you. 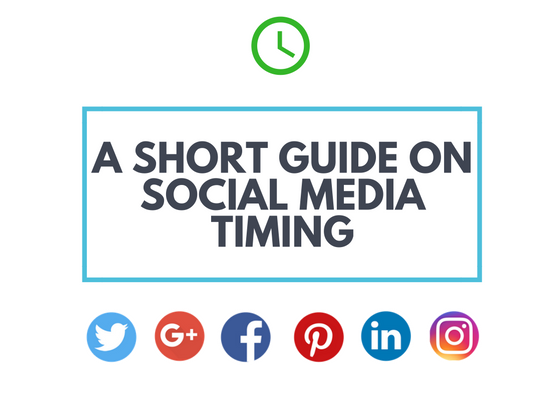 So, knowing the best times to post on each network is crucial for your social media marketing strategy. 310 million people worldwide use Twitter and visit the service 930 million times a day. That is why it is important to always get right to the point when you tweet a message. 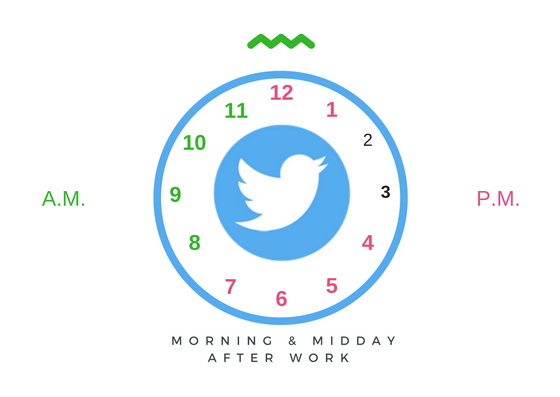 The Twittersphere is most active during the daytime hours between 8 a.m. and 7 p.m. Tweets posted during that time will generate 30% more interaction. Tweets on weekends generate 17% higher engagement than on weekdays. Nonetheless, there are several time slots a day with a significantly higher engagement rate. From 8 a.m. to 10 a.m in the morning, between 11 a.m. and 1 p.m. around midday and from 4 p.m. to 7 p.m. in the evening. Facebook gives you a lot of freedom to present your content. Text posts work as well as images and videos. Nonetheless, Facebook especially highlights content that provides a fast sighting of the timeline - so keep it short and simple. On the other hand, the google community is more affine to technical content and prefers more detailed postings. The social rush-hours on Facebook are between 1 p.m. and 4 p.m. in the afternoon and between 6 p.m. and 10 p.m. in the evening . 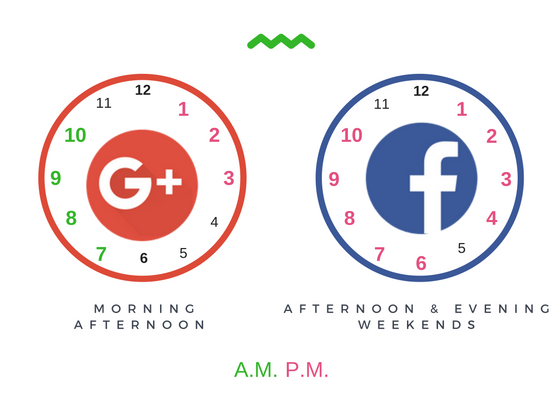 On Google+ you get the most interactions between 7 a.m. and 10 a.m, as well as between 1 p.m. and 3 p.m. in the afternoon. The average impressions and interaction rate decreases on Google+ on weekends. On Facebook, however, there is a significant social rush hour between 12 p.m. and 1 p.m. on Saturdays and Sundays. 433 million people use LinkedIn, making it by far the biggest business network. The network is best used for social selling and b2b communication. On average, each user checks his LinkedIn Account twice a day. So you have just two time slots a day to attract the people you want to engage with. 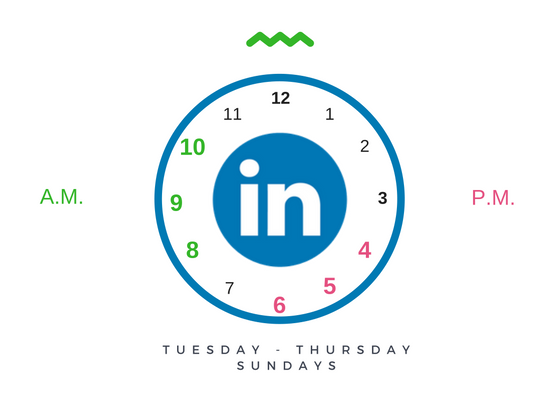 The social rush-hours on LinkedIn start around 8 a.m. in the morning and 4 p.m. in the afternoon, each one lasting about 2 hours. Remember the time difference when you post for international clients. However, postings on Thursdays and Sundays gain the most average impressions. Whereas the engagement rate peaks between Tuesday and Thursday. Whereas Instagram is real time communication with images, Pinterest focuses on brand communication. While you can organize your pictures on Pinterest by pins, Instagram displays your images in a single stream. Therefore, the lifetime of an image on Instagram is much shorter than on Pinterest. Both networks are among the social networks with the highest rate of growth. However, the social rush hours are pretty much the same on both picture networks. 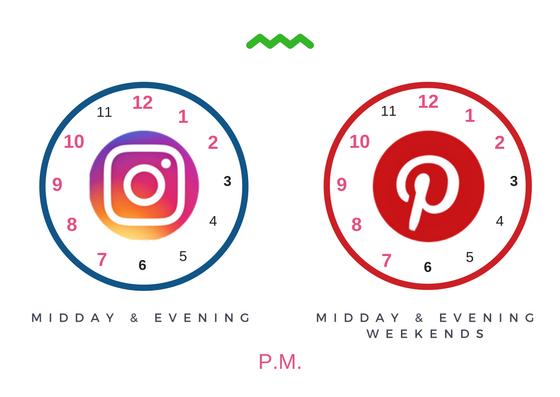 The best times to post are around midday between 12 p.m. and 2 p.m. and in the evening between 7 p.m. and 10 p.m. Generally, the interaction rates peak outside the office hours and, especially on Pinterest, during weekends between 11 a.m. and 2 p.m. Regardless of these times, do always keep in mind that every community is different. Your fans might be online and ready for engagement at totally different times. So use these guidelines as a starting point for your own analytics and always keep in mind to schedule for different timezones. Studies show that effective scheduling can improve your visibility on the respective networks. Accordingly important is a profound knowledge on the best times to post on social media. Please share your results and recommendations with me and with others. I'd be glad to know what works for you and what doesn't.